Russian scientists talk ideas and present their projects at Moscow Science Week 2014. Moscow hosted Science Week, a forum dedicated to new discoveries, from September 8-12. The event brought together specialists and scientists from various realms of scientific knowledge and many countries to present and discuss their projects. Here we highlight a few projects with the greatest potential to help humanity. “The average temperature in Russia will rise by 7 degrees C and reach +5 C by the end of the 21st century,” says Alexandr Chernokulsky, a research fellow at the Laboratory of Climate Theory at the Obukhov Institute of Atmospheric Physics. According to Chernokulsky, spring 2014 was the second hottest in the history of meteorological observations throughout the world, losing out only to 2010. In May 2014, the temperature averaged 0.74 C higher than the 20th century average, at +15.54 С. Central Asia, northeastern Siberia and Australia experienced the hottest temperatures. The area of thick ice in the Arctic is shrinking. “The release of methane is intensifying the process of global warming,” Chernokulsky says. “The point of no return has already been passed for permafrost.” According to him, unique data obtained by Russian submarines was recently made available to scientists and it points to a catastrophic reduction in ice area. Several computer models show that there will be no ice left in the Arctic by 2040-2050, and deleterious changes in climate are unavoidable at this point, he continued. According to recent research conducted at the Laboratory of Climate Theory, because of climate change, extreme weather phenomena such as blocking anticyclones may occur with greater frequency in Europe and throughout the entire Northern Hemisphere. This will cause catastrophic droughts and extreme heat. For example, Chernokulsky pointed out that during the 2010 anticyclone, the temperature in Moscow rose above +33 C on several days. General Hospital at the Massachusetts Institute of Technology bought Balakin’s proton accelerator last year. All major global producers of this type of technology participated in the tender, but the Russian scientist’s relatively inexpensive, yet highly productive invention won out. Scientists believe that proton therapy offers numerous benefits. The gamma radiation used in beam therapy not only impacts tumors, but also destroys the healthy cells in its path. Proton radiation is gentler. A proton beam can focus on a particular area with high accuracy – up to fractions of a millimeter. It takes 10 minutes to treat a cancer patient in Balakin’s unit – a third of the time it takes for many other technologies on the market to do the same thing. In Russia, the new proton accelerator was recently installed at hospitals in Pushchino and Protvino in Moscow’s suburbs. “Beam therapy will shift primarily to the use of proton units in the next 10 to 20 years,” Balakin says. 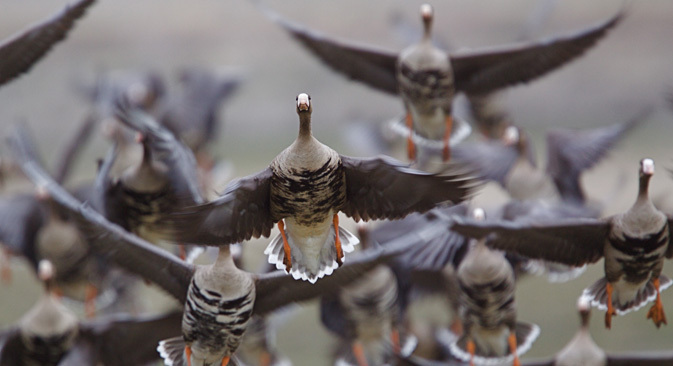 Petr Glazov, a research fellow at the Institute of Geography at the Russian Academy of Sciences, studies the migration of Arctic geese, which include the white-fronted goose and other species that fly from Europe to the Arctic to reproduce. The research’s objective is to ascertain how to manage a population of birds in order to prevent their extinction. Similar projects have long been under way in Europe, but until recently the scientific community did not have the slightest idea about the geese situation in Russia. For the first time, scientists at the Institute of Geography have started trapping and banding birds on their way to the Arctic. According to Glazov, the main problem that geese face in Russia is overgrowth on agricultural land. Abandoned fields and fallen trees are not beneficial for birds because the grass is unsuitable for food. Another issue is that Russians actively hunt geese. Therefore, the birds are often forced to land in unexpected and unsuitable places, including industrial zones. Scientists think Russia needs to create a series of specially equipped rest areas for geese.